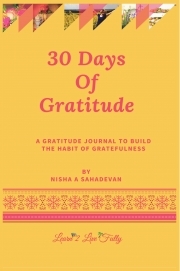 Description of "30 Days Of Gratitude"
Do you wish to live a happier life? There is no greater secret to happiness than being grateful for what you already have. Start to build your gratitude muscles, using 30 Days of Gratitude. 30 Days Of Gratitude is a Gratitude Journal filled with prompts and quotes to encourage you to live a life filled with gratefulness. You will find thirty gratitude prompts help you to recollect your gifts. You will learn to find joy in the smallest things in your life by practicing gratitude. Want to be more expressive? Draw a picture or stick a photo on the picture page to show your deepest form of Gratefulness. Reviews of "30 Days Of Gratitude"